The original set of 10 raspberries that I ordered (Polka), failed miserably, dissappearing without trace. I replaced these with 10 Autumn bliss. The rhubarb has done really well, of the 6 plants originally planted, one dissappeared, this was replaced, and its replacement promptly disappeared too. No idea how, or where, I suspect something mammalian stole them. The variety I have is called Timberley early, and when they say early, they really mean early. They start producing shoots as early as December, although these tend to get taken by the frost. It is not unusual however to be harvesting rhubarb stalks by the time the clocks go forward at the end of march. I have been very impressed by how productive these 4 rhubarb plants have been. In 2009 I harvested 40lb! I had so much I sold some to a local deli, as well as putting some into the freezer, bottling some, and of course, a large amount of rhubarb crumble. People have asked me for more details about the apple trees. So I have included below a summary table, and breakdown for each of the trees. This is mostly for my benifit, it might help others tho. The Bramley M20, Falstaff, and Reverend Wilks currently live in 19" Whiskey barrels. This limits how big they get, and means that I can take them with me if I move house at anypoint. The two M111 root stock trees are planted in 18" Wooden planters. The next 5 trees are grown along a fence in a cordon. The Schone Von Boskoop was inherited from my fiance's allotment in the Netherlands. It lives in a large teracotta pot. Originally I ordered 10 Ben Sarak for the garden, of these I gave one to a friend, and kept 9. These were planted in the soil and have done amazingly well. I got a small harvest off them in their first year, which surprised me somewhat. In the second year the 9 bushes remaining gave me a harvest of approx 300gm, which was just enough to produce 1 jar of blackcurrant jam. In the 3rd year, 2009, I got a bumper harvest of almost 3lb, which became 6 jars of jam, and some in the freezer for apple and blackcurrant crumble during the winter. When I hired the digger to help break the ground in the garden, and bring it into cultivation, I accidentally drove over two of the blackcurrant bushes with the digger, but both plants have survived and are producing fruit! 2013 Update: 2013 has proved to be an outstanding year for the blackcurrants, yielding 15lb of fruit. As well as all the fruit trees and bushes listed above, my garden is home to 3 Hop plants. The oldest was planted in 2008, and is a Fuggle. I must be entirely honest and admit that I bought it because of the name. This bine has done wonderfully collonising the fence infront of the compost heap, providing a nice green barrier hiding the heap from view. The harvest in the first year was minimal, but in the second year it produced an impressive crop. Pleased with the success of the Fuggle I decided to add two more hop plants to the garden. Living in East Kent I have the honour of being able to genuinely grow East Kent Goldings. Due to the Protected Geographical Indication (PGI), you can only call it East Kent Goldings when grown in East Kent (Just Goldings if grown elsewhere). Being in the position to take advantage of a PGI, I would have been a fool not to add an East Kent Goldings hop plant to my garden. To balance out the Hop collection I added a Wye Challenger as well. These were both planted in 2009, and should start to produce a reasonable harvest from 2010 onwards. Since writing this page, I have suffered some loses in my fruit tree's. The Falstaff, and one of the cider apple tree's did not make it through the heat of 2012, whilst the Reverend Wilks Cordon was the victim of what I am presuming is someone falling through the bushes outside my garden and breaking it. 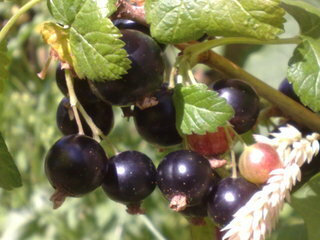 Not all 10 of the Autumn Bliss canes survived 2012 intact, just 4 are providing a small crop of exceptionally tasty fruit. One blackcurrant plant has also died, due to a misplaced boot. Leaving just 8 plants. With the hops, the East Kent Goldings hop bine did not survive it's first year. Cause of death, unknown. The Fuggle is going from strength to strength, colonising large swathes of the garden. The Wye Challenger is quite content to bimble up next door's tree, but producing very little by way of a viable crop, even after 4 years. http://www.keepers-nursery.co.uk/ - Sells lots of varieties of trees, and very affordable! http://www.blackmoor.co.uk/ - Interesting selection of trees, very competitively priced, and extended shipping period. This page last modified Saturday, 14-Feb-2015 00:11:24 CET.